European governments and the EU should safeguard the JCPOA and vigorously plan for contingencies should the US continue to backtrack on the nuclear deal. This should primarily focus on legal, political, and economic measures that can ringfence European companies from the enforcement of US secondary sanctions. Europe should also pursue the political openings created by the nuclear deal to engage in tough diplomacy with Iran on non-nuclear issues. The most promising areas for tangible, albeit incremental, progress include: freedom of navigation in the Persian Gulf, reducing the violence in conflicts in Yemen and Syria, and lowering tensions in Iraqi Kurdistan. The EU should facilitate dialogue with regional powers with the aim of creating greater transparency over ballistic missile capacities in the Middle East. European countries and the EU should further nurture the channels they have developed with the Iranian leadership to help counterbalance the impact of Donald Trump’s polarising narratives on regional developments. Donald Trump is not easy to get along with. On many global security issues, Europeans take very different approaches than the new American president. But perhaps nowhere is the difference more profound than on the question of Iran. Given the president’s harsh rhetoric and his recent efforts to put that talk into practice, a transatlantic clash on the issue seems almost inevitable. European countries should prepare now to minimise the damage and preserve their strategic interests on non-proliferation and the pursuit of stability in the Middle East. Trump wants to shift US policy on Iran towards aggressive containment and away from the diplomatic openings created by his predecessor. The primary focus of this shift is the Joint Comprehensive Plan of Action (the JCPOA), a multilateral nuclear accord to limit Iran’s nuclear programme which Trump has called an “embarrassment” and “disastrous”. The US president has also consistently condemned Iran as a “fanatical regime” and “rogue nation”, placed expansive travel restrictions on Iranian nationals, and urged other nations to isolate the country. His administration has unambiguously sided with Iran’s regional rival, Saudi Arabia, in addressing the conflicts in the Middle East. In October, the White House released a revised US strategy towards Iran, with a heavy focus on “neutralizing” Iran’s “destabilizing influence and constraining its aggression” in the region. Trump also decided to ‘decertify’ Iranian compliance with the JCPOA, meaning that he will not attest to Congress that Iran is abiding by the terms of the deal. In response, the heads of state and government of France, Germany, and the United Kingdom released a rare joint statement expressing concern at Trump’s policy. 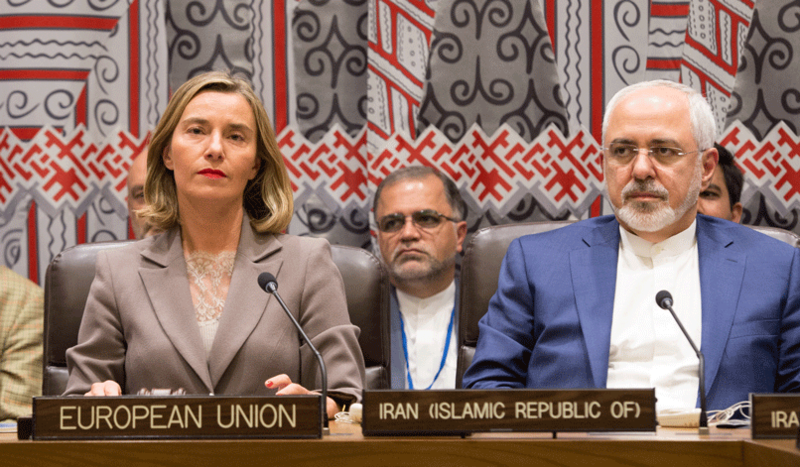 The process surrounding the nuclear deal has already strained transatlantic ties and, as the European Union foreign policy chief Federica Mogherini warned, reduced the credibility of the US as a partner for future European policy on Iran. The current trajectory not only endangers European non-proliferation goals, but it also heightens the risk of a nuclear arms race and further military escalation in Europe’s backyard. Direct or indirect confrontation between American- and Iranian-backed forces across the Middle East will further fuel the regional conflicts, particularly in Iraq and Syria, that have already imposed heavy costs on Europe. European leaders do share many of the concerns of the US with regard to Iran. But they take a strikingly different approach from the Trump administration to dealing with Iran. They consistently voice unanimous support for the JCPOA and broadly favour similar multilateral engagement to address outstanding areas of grievance with Iran. European leaders have warned that ditching the nuclear deal, as Trump has threatened to do, would make it much harder to resolve other disagreements with Iran. Moreover, some European officials privately say that isolating and excluding Iran from the international community may cause more hardline elements of the Iranian leadership to “take measures that further fuel regional instability”. This paper looks at how the Trump administration will seek to implement this new Iran strategy and provides a comparison with the European approach. It outlines the consequences that are likely to follow from a more confrontational strategy toward Iran and examines the implications for European security interests. It concludes that Europe should not only try to preserve the nuclear deal with Iran, it should also make contingency plans to salvage the relationship with Iran if the US defects. This includes taking measures to protect European banks and companies from US secondary sanctions. In the meantime, however, European governments need to demonstrate that the current diplomatic track can lead to progress on the issues of concern with Iran. They should do so by first leading on or at least encouraging negotiations on issues such as ensuring freedom of navigation in the Persian Gulf, de-escalating the wars in Yemen and Syria, and stabilising Iraq in the aftermath of the Islamic State group (ISIS). Europe will also need to find a pragmatic approach to addressing the concerns with Iran’s ballistic missile programme. European capitals will need to maintain constructive channels with both Tehran and Washington, and resist pressure from the US to once again isolate Iran. A gradual process of confidence building and rapprochement has been underway between the EU and Iran for several years. A new round of nuclear negotiations began in 2013 at roughly the same moment that Iranian voters elected Hassan Rouhani as Iran’s president. His administration shunned his predecessor’s brash isolationism and anti-Western rhetoric. With the support of the Obama administration, the EU found the political space to thaw relations with Tehran by pursuing economic and political engagement. Countless European trade delegations have visited Iran, with the EU reporting a 94 percent increase in Iran-EU trade in the first half of 2017 from the same period in 2016. As Mogherini has said, “Europe feels an interest and a responsibility to engage with Iran”, and indeed a growing number of European governments believe that diplomacy with Iran can be an effective means of reducing the violence and instability in the Middle East. But robust engagement with Iran on regional issues has yet to be seriously tested. Those who are fiercely critical of any diplomatic opening with Iran, such as Israeli prime minister Binyamin Netanyahu, argue that negotiations would only create greater space for Tehran to continue actions that destabilise the region. Republicans in Congress made similar criticisms when the Obama administration, together with European partners, began negotiations with Iran over its nuclear programme. Yet, not only did the talks result in a deal that addressed the most critical security concerns of the West, Iran has also delivered on its commitments. Since this diplomatic process began, engaging rather than excluding Iran on regional issues has at times produced results that are in the mutual interest of the West and Iran. For example, a quiet political exchange between Iran and some European countries, together with local actors, contributed to easing Lebanon’s political deadlock in 2016. The US too has found it advantageous to work with Iran on certain regional issues, such as the anti-ISIS fight. In that case, the US-led forces and Iran have, through the Iraqi government in Baghdad, established a system for de facto military coordination. However, relations between Europe and Iran remain far from normal. A combination of factors ranging from lingering distrust, mutual disappointment over the lack of progress, and their opposing stances on a number of regional issues have limited the rapprochement. Divisions between Iran and Europe are on full display in Syria and Yemen where each has backed opposing sides. There are also deep disagreements related to Iran’s support for non-state actors in the region, its arming of Hezbollah, and its position on Israel – and more recently concerns over Iran’s expanding ballistic missile programme. In these areas, Europeans have generally worked with the US. They have supported, for example, the Trump administration in its complaints to the United Nations about Iran’s ballistic missile tests. Meanwhile, Iran is frustrated by the paltry level of European investment in the Iranian economy. Increased European investment is a critical piece of the Rouhani government’s effort to attract an annual target of $50 billion in foreign direct investment and to boost job growth. The easing of sanctions since the JCPOA has allowed for an uptick in trade, but Iranian policymakers and the business sector remain disappointed by the level of European investment in Iran. Financing for such investments is in short supply and most banks in Europe are sensitive to US politics on Iran given the high degree of exposure they have to the US market and regulators. A handful of smaller and state-owned European banks, particularly those in Austria, Denmark, France, and Germany have provided financing for deals and investments in Iran, and some governments such as Denmark and Italy, have provided credit lines to support exports to Iran. However, major European banks, whose financing is needed for longer-term and bigger investments inside Iran, have remained reluctant. Various expectations and preconditions mean that Europe and Iran risk mutual disappointment in their effort to improve relations. Tehran wants European capitals to do much more to encourage economic exchange, resolve the complex banking deadlock, and to oppose Trump’s attacks on the JCPOA. Similarly, European governments want to see signs of good faith from Iran beyond the nuclear issue, such as less Iranian support to non-state actors and militia groups in the region, greater Iranian pressure on the Assad regime to accept political transition, and less frequent testing of Iranian ballistic missiles. Their Iranian counterparts view such expectations as unrealistic, and at times naive, considering Iran’s domestic politics and a regional environment that is increasingly hostile to Iranian interests. Over the past year, the E3 (the UK, France, and Germany) and the EU have firmly expressed to the US their continued commitment to the nuclear deal. They have made the case that the Trump administration would be isolated on the Iran issue if it chose to walk away from the JCPOA. Some European governments have also said that the JCPOA’s survival is a precondition for their cooperation with the Trump administration on other areas of Iran policy, notably regional issues. They have attempted to persuade Trump that multilateral engagement on Iran is a more effective way to change Iranian calculations than a policy of containment. Although European capitals share many of the concerns of the US about Iran, Europe is quickly parting ways with the Trump administration over two fundamental issues. First, they disagree on what they are trying to achieve with Iran. Trump’s statements on Iran move US policy aims towards efforts to weaken the Islamic Republic and perhaps to the idea of regime change. The US secretary of state, Rex Tillerson, for example, effectively backed a regime change approach when he outlined that the administration would “work towards support of those elements inside of Iran that would lead to a peaceful transition of that government.” European governments, on the other hand, are hoping to see behavioural change from Iran in ways that promote European security interests and contribute to regional stability. The second source of European-US differences over Iran relates to the tools used to achieve these goals. European governments are moving away from isolating Iran using containment and sanctions towards engaging the country using diplomatic and economic tools. The Trump administration has moved in the opposite direction, seeking to isolate Iran through political measures and tougher sanctions. Despite these European efforts, there is a broad tendency in Washington among both Democrats and Republicans to assume that European governments can be co-opted or coerced to follow US policy on Iran. US observers believe that, when faced with a choice of doing business with Iran or facing economic US secondary sanctions, European governments and businesses will opt to preserve their US ties. They also tend to believe that, by threatening to adopt a confrontational position towards Iran – to include killing the nuclear deal, pushing for regime change, or even conducting limited military strikes against Iran – the US will coerce Europeans to come on board with less extreme policies, such as renegotiating the nuclear deal or demanding that Iran change its behaviour on regional files. In opposing Trump’s policy towards Iran, European governments find themselves in the unusual position of being closer to Russia and China than to their traditional transatlantic partner. Politics inside Washington has created a broad consensus in the Trump administration and Congress on the need to get tough on Iran with the ultimate objective of significantly weakening Iran’s leadership. In October, Trump outlined the new US Iran strategy that has at its heart an effort to derail the JCPOA, and to contain and confront Iran, leaving little political space for diplomacy. Implementation of such goals, however, will be difficult. As administration officials admit, Iran’s regional footing is stronger now than at any time since the start of the 2003 Iraq war and its ability to impose costs on the region and the US is also greater. Given the new level of the challenge, the administration has had an often fierce debate on how precisely to confront Iran. Currently, it appears that two broad factions have emerged: Donald Trump and everyone else. The president has taken every opportunity to broadcast his animosity towards Iran. He has called for the country’s international isolation and sought to pressure foreign companies not to do business with the country. So far Trump has channeled his stated intention to get tough on Iran into attempts to dismantle or undermine the nuclear agreement. There is little doubt that Trump seeks to undermine the Iran nuclear deal negotiated by his predecessor and world powers. Despite assessments by US generals and eight reports from the International Atomic Energy Agency (IAEA) that verify Iranian compliance, Trump claims that Iran is violating the “spirit” of the deal. In his October speech, he outlined that he was willing to end US participation in the nuclear deal unless it was amended to extend the expiration dates of various Iranian obligations (the so called “sunset provisions”) and to include tougher limitations on Iran’s missile programme. On regional issues, Trump has already doubled down on US support to Saudi Arabia in its regional feud with Iran. This stands in stark contrast to Obama’s attempt to encourage greater accommodation and compromise between the two regional powers. The US administration has also stepped up backing for the Saudi military campaign in Yemen, in part to weaken Iranian-allied Houthi forces. Trump has sided with Saudi Arabia even where this has put the US at odds with other key regional allies such as Qatar. This followed Trump’s agreement to sell Saudi Arabia $110 billion in weapons, an agreement hailed by the White House as the single largest such deal in US history. In contrast, some of Trump’s cabinet members, including secretary of defence James Mattis, seem intent on moderating the president’s pronouncements on Iran. Moderation in this context means that, although this camp believes in increasing the pressure on Iranian regime, it also believes that retaining the JCPOA is the best way to do so. It has reportedly pressed Trump to adhere to the nuclear deal to keep allies on board with pursuing a more active and aggressive pushback on Iran across the region. The views on Iran of many of these military officers in Trump’s cabinet are coloured by their own and the US military’s experience with the Iranian Revolutionary Guard Corps (IRGC) in Lebanon and Iraq. The deep animosity towards the IRGC was reflected in the White House fact sheet on the US strategy towards Iran, which is heavily focused on countering the IRGC. Close advisers to this camp say that they seek to avoid direct military confrontation, but that the US should support covert and overt military pushback against Iranian assets in the region. They tend to favour supporting Arab allies to engage in greater asymmetric warfare against the IRGC and Iranian-backed forces (in particular Hezbollah), together with placing greater economic sanctions on such entities. As a former US official acknowledges, a similar approach was employed in small doses by the Obama administration, but the Trump administration seeks to make it a centrepiece of US policy. While supporting a more assertive posture against Iran, this camp wants to avoid losing focus on the Trump administration’s priority of fighting ISIS. Senior US officials have reportedly cautioned against looser rules of engagement, which would allow US military commanders to respond more forcefully to the IRGC and Hezbollah forces in Iraq and Syria, out of concern that this would divert attention from the priority of fighting ISIS in the region. There is also a willingness in this camp to engage with Iran where this serves US interests. Tillerson has indicated that he is open to diplomacy with Tehran. In the Department of Defence, there is some support for establishing lines of deconfliction with Iran to avoid skirmishes between naval forces in the Persian Gulf. Overall, the moderates have swayed Trump to accept a subtler approach to dealing with Iran. Trump seems unwilling to deliver a deathblow to the nuclear deal. He has so far twice used his executive power to renew waivers of sanctions as required under the JCPOA. Instead, the October decision to decertify Iranian compliance with the JCPOA provides a face-saving way for Trump to look tough on Iran but to shift the immediate responsibility over the fate of the nuclear deal onto Congress. Yet, even if Trump is isolated, he is the president. It remains unclear if he is interested in renegotiating a better deal or simply aims to shut the door to all diplomacy with Iran. Even if Congress does not follow Trump’s decertification of the JCPOA by ending the deal altogether, the US commitment to the agreement is likely to hang in the balance every three months when Trump must decide to re-waive US sanctions on Iran (with the next waiver deadline looming in January 2018). The unpredictability surrounding his position on the nuclear deal, even with his own cabinet members and closest allies, has essentially put the deal in limbo. As the battle over the nuclear deal between Trump and his cabinet rages on, the US and Iran have stepped up their shadow boxing in the Middle East. On several occasions, Iranian and US naval ships have narrowly avoided incidents in the Persian Gulf. Their respective forces on the ground have clashed in Iraq and Syria, and Iranian drones and US fighter jets have clashed in the air over the Middle East. The Trump administration has sanctioned Iranian entities and persons involved with the ballistic missile programme and observers expect tougher Congressional sanctions on this issue in the coming year. All of this means that European governments should prepare for increasing tensions between Iran and the US. Iran’s immediate foreign policy priority is to ensure that it gradually reintegrates into the international community. Iran’s competing factions have united behind preserving the JCPOA, as an important part of the effort to ensure that Russia, China, and particularly Europe, side with, or at least are sympathetic to Tehran, in any potential clash between Iran and the US. Iranian officials believe that such an international consensus on Iran is the most effective means of safeguarding the country from the type of UN Security Council sanctions that laid the groundwork for Iran’s isolation during the 2000s. Through its moderate and globalist outlook, the Rouhani administration has used every opportunity to underscore that Iran is the more reliable and reasonable partner for Europe relative to the Trump administration. Within hours of Trump’s speech outlining the new US strategy on Iran, Rouhani hit back in a televised address, emphasising that the US administration is more isolated than ever, and vowing that Iran would remain in the JCPOA so long as it serves its national interests. Earlier in the year Rouhani explained that the Iranian government will “be vigilant not to get caught in [the US] trap” to provoke Iran into violation of its JCPOA obligations, and instead seeks to continue “walking on the path of progress”. For this progress, particularly on the economic front, the Rouhani administration is looking to Europe. However, not all the power centres in Iran believe this is the right path, and see the outreach to Europe as a gamble that Iran is likely to lose. Like most Americans, they believe that Europeans will inevitably follow US policy on Iran. These concerns were outlined in a speech by Iran’s Supreme Leader Ali Khamenei who emphasized that Europe was not doing enough to oppose US obstruction of the JCPOA and must also “avoid intruding into [Iran’s] defensive affairs” ]. Trump’s decertification of the nuclear deal vindicates the position of Iranian hardliners that the US cannot be trusted to deliver on its promises. Those who bitterly opposed the nuclear negotiations have increased their push for Iran to develop stronger and more strategic ties to Russia. They have high expectations for the visit of Russian president Vladimir Putin to Iran scheduled for later this year. For the most part, Iran has responded not to Trump’s war of words, but directly to US actions. For example, in response to additional US sanctions targeting the Iranian missile programme and the IRGC, Iran has passed its own counter-sanctions against the US, vowed to continue its missiles tests and increased the budget available for its missiles and the IRGC. The Iranian government has said will not renegotiate aspects of the nuclear deal that Trump wants to reopen, such as expiration dates for certain restrictions placed on Iranian nuclear activities, nor is it willing to consider restrictions on its ballistic missile programmes. Iran has also cautioned that tensions over the nuclear issue will have consequences in the region. Iran’s vice-president and chief nuclear negotiator, Ali Akbar Salehi, called on the West to take more constructive actions towards engaging Iran and warned that failure to honour the nuclear agreement could result in “chaotic behaviour by various actors and further tension and conflict, with everybody ultimately losing”. In private discussions, Iranian officials often highlight to European counterparts that if Trump sabotages the nuclear deal, there will be little support inside Iran for reaching other compromises with the West on regional issues. In such an instance, they argue that the more hardline power factions inside Iran that are opposed to the US will have a stronger mandate to impose costs on Western allies, assets, and interests in the region. Meanwhile, the IRGC commander Major General Mohammad Ali Jafari has renewed calls to the US to withdraw from military bases that are within 1,000 km of Iranian borders. Jafari has warned that the US policy of equating the IRGC with terrorist organisations “would be a big risk to the US and its bases and forces stationed in the region” and later clarified that such measures would force Iran to consider “the American army to be like the Islamic State around the world.” The IRGC has also accused Saudi Arabia and the US of working in concert to subvert Iran’s domestic security, including involvement in the terrorist attacks in Tehran in June, even though ISIS claimed responsibility. Trump’s position towards Iran and the region has provided the IRGC with ammunition for its domestic battles. There is now greater consensus among the formerly competing power factions inside Iran on the need to actively develop Iran’s missile capability. In response to Trump’s new policy goal of ending Iran’s ballistic missile programme, Rouhani promised that his country was now more determined to boost its missiles capacities. Various political factions inside the country, that deeply disagree on domestic policy, have united to rally behind Iran’s missile programme as a deterrent against a military strike by neighbours such as Saudi Arabia, the United Arab Emirates, or Israel. The tough position towards the IRGC from the Trump administration has also resulted in consolidating greater public and political support for the group. The Rouhani administration and the more reform-minded factions have for now set aside the type of differences with the IRGC which publicly surfaced during the 2017 Iranian election campaigns. The latest US financial sanctions targeting the IRGC in October, which fell short of designating the group as a foreign terrorist organisation, were nevertheless met with unanimous pushback from the Iranian government. Zarif commented on social media that “Iranians-boys, girls, men, women, are all IRGC: standing firm with those who defend us and the region against aggression and terror”. Trump’s decertification of the nuclear deal has triggered a new environment of unpredictability surrounding the JCPOA. Even if the US Congress decides to protect the nuclear deal, European governments will need to prepare for continual battles with the Trump administration over how the deal is implemented. European actors will also need to be far more proactive in fixing the existing problems in the deal. Under Trump, the US government will be far less flexible and cooperative in resolving the banking and financial problems currently facing European companies. European governments and EU regulators will need to take a greater lead in tackling these constraints, including allowing the European Investment Bank to be a provider of financing to European companies undertaking legitimate investments in Iran. European governments should also reinforce existing coordination over contingency plans if the US obstructs the nuclear deal. The EU and E3 should assume leadership of a political initiative that, together with Russia and China, offers Iran enticements to continue to abide by the core elements of the current deal. Essentially, Iran should be expected to maintain the critical restrictions and inspections on its nuclear programme in return for an economic assistance package offered by the remaining parties to the JCPOA. This contingency plan needs to be communicated clearly to reassure European companies and signal to the US that Europe is serious about its commitment to the deal. Without the US, Iran is unlikely to accept all the obligations outlined in the JCPOA. However, keeping Iran on board with the JCPOA’s material restrictions is likely to limit Iran’s ability to expand its nuclear programme. This in turn will reduce the possibility of military strikes against Iranian nuclear facilities by Israel or the US. As part of this plan, the EU and European governments will need to push back against the enforcement of renewed US secondary sanctions. This will be necessary to reassure European companies that they will not be penalised by the US for undertaking legitimate business with Iran. It will also provide some comfort to Iran that it can continue reintegrating into international economic markets. If this political route fails, Europe should threaten to use legal mechanisms that block or penalise the enforcement of US extraterritorial and secondary sanctions which unreasonably target European companies. To this end, the E3 have already begun reviewing a similar scenario from the 1990s, when Europe and the US clashed over sanctions against Iran, Libya, and Cuba. Taking a similar approach today would be more complex. Given the high degree of connectivity between European banks and the US financial system, European companies now have far more assets exposed to US regulators, who could retaliate against them, or force them to pick between the Iranian and the US markets. It will be much harder for European leaders to place political pressure on Trump through international mechanisms for which he has demonstrated little respect. To devise smart contingency plans, it will be imperative for European governments to increase their coordination with China, Russia, and other Asian economic giants such as India, South Korea, and Japan. Not only do their interests align with respect to the JCPOA, they also share a more general concern about the use of US secondary sanctions. While defending the JCPOA, Europe should not lose sight of pursuing the opening created by the nuclear deal to test diplomacy with Iran in other areas where it is urgently required. After four years of gradual engagement between Iran and Europe, it is time to address some of the more contentious issues. The E3 have both the capacity and a strong stake in leading this European effort. European leaders should communicate clearly to both Washington and Tehran a serious intent to begin diplomatic talks beyond the nuclear issue. The position of the Trump administration on Iran poses a considerable challenge to this effort. Yet it is still possible for Europe to push for meaningful diplomacy with Iran in some limited but significant areas, some of which are outlined below. Trump’s stance towards Iran does give European countries more bargaining power in negotiations with Iran. Tehran now looks to European capitals to ensure that its economic and political reintegration continues. European countries and the EU should carefully use their economic cards, with a longer-term vision of what economic integration can achieve. Europe should use the current environment to emphasise that, before economic relations can fully normalise, Iran will need to show progress in meeting the guidelines set by the International Monetary Fund and the Financial Action Task Force. European governments and the EU should both press Iran for, and offer to assist with, reforms to its domestic business environment that promote greater market liberalisation and reduce the IRGC’s expansive footprint in the economy. Deepening this economic integration could eventually inspire Iran to give more weight in accommodating European security interests through a pragmatic calculation of the benefits they stand to lose. But this leverage has its limits. The E3 should avoid linking the continued implementation of the nuclear deal to concessions from Iran on non-nuclear issues. Such an effort would more likely achieve the opposite outcome, by provoking Iran to test the limits of the JCPOA in addition to doubling down on its regional behaviour. In setting an agenda for engaging with Iran, European governments should set realistic benchmarks based on their influence and a sober understanding of Iranian red lines. Europe should focus its efforts on areas where there is a greater chance of achieving some progress, even if it is incremental. Tangible results from diplomacy are the best answer to the Trump administration’s proposed policy on Iran. Freedom of navigation in the Persian Gulf: The EU should start a multi-stakeholder review of maritime operations and freedom of navigation in the Persian Gulf. The Trump administration has explicitly outlined this as an area where Iranian activities must be checked. This process could provide a diplomatic platform to coordinate and de-escalate tensions not only between Tehran and Washington, but also other regional actors. It should focus on reducing the rising number of incidents between naval vessels in the Persian Gulf. The Yemen conflict: France and the UK, which are the most active European countries in supporting the Saudi-led coalition fighting in Yemen, should push Iran, Saudi Arabia, and the UAE towards a compromise to reduce the violence and humanitarian costs of the crisis. European aid and assistance should be offered to implement such agreements. This is urgently necessary given the absence of meaningful support from the Trump administration for a political process. This can begin with a focus on expanding ceasefire zones in Yemen. In Syria, while Europe is clearly not in the lead of political negotiations, given the lack of interest from the US administration in engaging with Iran on Syria, there may be a helpful role that countries such as France can play in the outreach to Tehran. European governments and the EU should press Iran on the need for meaningful humanitarian concessions as a necessary part of wider de-escalation and moving forward on a political process in Syria. Europeans should emphasise that, without such progress, it will be difficult to push back against efforts from the Trump administration to take a more aggressive stance on the IRGC. Iraqi Kurdistan: To lower tensions between Baghdad and the Kurdish Regional Government (KRG), European governments should test the possibility of convening a multilateral political process, one that would include Iran. This should also include local actors from Baghdad and the KRG, together with regional powers Turkey and Saudi Arabia as well as the US. Washington is likely to press the EU to introduce more biting sanctions in response to Iran’s ballistic missile programme. There is already support for this approach among some member states as long as the sanctions do not undermine JCPOA commitments. In considering this tool, European governments should acknowledge that it is highly unlikely that such sanctions will persuade Tehran to give up its missile programme as advocated by many in Washington. Nor are these sanctions likely to be supported by China and Russia as the nuclear-related sanctions once were. This is especially the case in the current context of Iran-US tensions and against the backdrop of expansive arms sales from the West to Saudi Arabia, the UAE, and Israel. A more pragmatic approach to this issue would be for the EU to facilitate a European dialogue with regional powers with the aim of placing limits on the range of ballistic missile capacity. One option is to encourage regional actors known to possess ballistic missiles, such as Iran and Saudi Arabia, to voluntarily apply the Missile Technology Control Regime (MTCR). The MTCR framework could yield immediate benefits by reducing the use and export of ballistic missile systems. In this effort, Turkey may be a useful partner since it is the only country in the region to have joined the MTCR and has positive relations with both Iran and Saudi Arabia. Another option is for the EU and European governments to urge states to join the Hague Code of Conduct Against Ballistic Missile Proliferation (HCoC) that requires members to provide annual updates on their ballistic missile programme and to issue notifications prior to testing such missiles and satellite launches. These measures can build confidence and eventually facilitate discussions over greater transparency and limits on regional tests of ballistic missiles. The Trump administration will increasingly pressure European countries to limit engagement with Iran. In response, Tehran is likely to seek to widen existing divisions between Europe and the US over the nuclear deal. European governments will need to resist both sides and instead maintain good relations with both Washington and Tehran. Europe’s distinct role in helping to de-escalate political crises in the Middle East hinges on its ability to engage with all relevant powers, including Tehran, Riyadh, and Washington. At a time when unpredictability and conflict in the Middle East are at a peak and when Iran-US relations have deteriorated, Europeans should seek to nurture channels of engagement that they have developed with various branches of the Iranian leadership and across the US government. European countries and the EU should use these channels to help counterbalance the impact of Trump’s dangerous narratives on regional developments. A symbolic but significant step towards countering the Trump administration’s containment policy would be for more European heads of state and governments to visit Iran. European countries should also coordinate with like-minded counterparts, such as Australia and Canada, to demonstrate the potential for the West’s relationship to eventually normalise with Iran. This would help convince the Iranian leadership that there is an alternative Western narrative to the Trump administration’s position and support the efforts of the more moderate factions inside Iran to restrain responses that are detrimental to European security. On a people-to-people level, the EU is in a unique position to reduce the damaging impact of Trump’s travel restrictions on Iranians, especially by expanding scholarships for young Iranians to study in Europe. Iran and the US are on a path towards escalation. The decade of close European coordination with the US on a multilateral solution to the Iranian nuclear programme represents a model for transatlantic cooperation. But the Trump administration’s preference for bilateralism will limit opportunities for this model to continue. The prevailing view in Washington is that the Trump administration can either force or co-opt European countries to follow the US lead on Iran policy. But Europeans have other options. They can instead use the rare convergence that has emerged with Russia and China on Iran to push the US to adhere to the JCPOA. This will provide an alternative to the containment strategy put forward by the Trump administration. The talks that led to the JCPOA provide a precedent for how Iran and the international community can compromise and accommodate one another’s interests. This model must now be seriously pursued with the aim of making progress on regional issues, or at least preventing existing conflicts from getting worse. The ultimate hope is that such engagement will create a more normal relationship where European countries and Iran could collaborate on issues of mutual interest, as well as compete normally when their interests diverge. The overall goal of such engagement should be to pursue tough diplomacy with Iran on non-nuclear issues, but with realistic expectations and aimed at achieving tangible progress. Incremental progress on resolving other areas of disagreement is likely to help build confidence between Iran and the West. Indeed, the implementation of the nuclear deal has already begun to achieve this. Overall, safeguarding the nuclear deal and managing a new relationship with Tehran is the best way for Europe to have a meaningful influence over global and regional security issues in which it has a tangible stake and influence. If the nuclear deal is undermined, there is little hope that there can be a diplomatic breakthrough with Iran on other contentious issues, and regional instability in the Middle East is likely to deteriorate further. In that case, Europe may be dragged once again into a confrontational relationship with Iran, complete with renewed sanctions and the ever-present threat of escalation. That would be a tragic shame. “Remarks by President Trump to the 72nd session of the United National General Assembly”, 19 September 2017, available at https://www.whitehouse.gov/the-press-office/2017/09/19/remarks-president-trump-72nd-session-united-nations-general-assembly (hereafter, “Remarks by President Trump to the 72nd session of the United National General Assembly”); “Full text of Trump’s Speech to AIPAC”, Times of Israel, 22 March 2016, available at http://www.timesofisrael.com/donald-trumps-full-speech-to-aipac/. “Remarks by President Trump to the 72nd session of the United National General Assembly”; “Remarks by President Trump on Iran Strategy”, 13 October 2017, available at https://www.whitehouse.gov/the-press-office/2017/10/13/remarks-president-trump-iran-strategy (hereafter, “President Donald J. Trump’s new strategy on Iran”) Iran has been listed in all versions of the travel ban introduced by the Trump administration. For details see “Trump administration announces new travel restrictions”, CNN, 25 September 2017, available at http://edition.cnn.com/2017/09/24/politics/trump-travel-restrictions/index.html. “President Trump’s Speech to the Arab Islamic American Summit”, 21 May 2017, available at https://www.whitehouse.gov/the-press-office/2017/05/21/president-trumps-speech-arab-islamic-american-summit. “President Donald J. Trump’s new strategy on Iran”. “Declaration by the heads of state and government of France, Germany and the United Kingdom”, 13 October 2017, available at https://www.gov.uk/government/news/declaration-by-the-heads-of-state-and-government-of-france-germany-and-the-united-kingdom. Off-the-record comments by senior European and EU official during interview with the author, October 2017. See also “A Trump retreat from the Iran deal would damage trust in US deal-making, EU ally says”, PBS Newshour, 11 October 2017, available at http://www.pbs.org/newshour/rundown/trump-retreat-iran-deal-damage-trust-u-s-dealmaking-eu-ally-says/. See “Iran nuclear deal: EU statement on the Joint Comprehensive Plan of Action”, 16 October 2017, available at http://www.consilium.europa.eu/en/press/press-releases/2017/10/16-iran-nuclear-deal-eu-jcpoa/; “EU Council Conclusions on Iran”, 14 November 2016, available at http://www.consilium.europa.eu/en/press/press-releases/2016/11/14-conclusions-iran/; “Remarks by High Representative/Vice-President Federica Mogherini following the Ministerial Meeting of the E3/EU + 3 and Iran”, 21 September 2017, available at https://eeas.europa.eu/headquarters/headquarters-homepage/32546/remarks-high-representativevice-president-federica-mogherini-following-ministerial-meeting_en. See also Gardiner Harris, “European diplomats speak out against Trump’s opposition to Iran deal”, the New York Times, 25 September 2017,available at https://www.nytimes.com/2017/09/25/us/politics/iran-deal-european-diplomats-trump-administration.html?mcubz=3. See, for example, comments from European External Action Service secretary general Helga Schmid, “Europe will do everything to preserve Iran nuclear deal – EU diplomat”, Reuters, 4 October 2017, available at https://uk.reuters.com/article/uk-iran-nuclear-eu/europe-will-do-everything-to-preserve-iran-nuclear-deal-eu-diplomat-idUKKCN1C90RQ. Off-the-record comments made by senior European official during interview with the author, July 2017. See, for example, Kostis Geropoulos, “EU, Iran ink nuclear deal”, New Europe, 24 April 2017, available at https://www.neweurope.eu/article/eu-iran-ink-nuclear-deal/. For an overview of these EU cooperation with Iran see “The EU Task Force Iran, Press and Media”, available at https://eeas.europa.eu/delegations/iran/area/press_en. See also Saeed Kamali Dehghan, “Europe’s business heads aim to keep Iran nuclear deal despite US threat”, the Guardian, 6 October 2017, available at https://www.theguardian.com/world/2017/oct/06/europes-business-heads-aim-to-keep-iran-nuclear-deal-despite-us-threat?CMP=share_btn_tw. See “European Commitment to the JCPOA - Keynote speech by EEAS Secretary General Helga Schmid, Zurich”, 4 October 2017, available at https://eeas.europa.eu/headquarters/headquarters-homepage/33511/european-commitment-jcpoa-keynote-speech-eeas-secretary-general-helga-schmid_en. See “Comments by Federica Mogherini, Atlantic Council”, 10 February 2017, available at http://www.atlanticcouncil.org/blogs/new-atlanticist/mogherini-iran-russia-trump. Under the leadership of King Salman, Saudi Arabia has been deeply opposed to any negotiations with Iran. See, for example, Ben Hubbard, “Dialogue with Iran is impossible, Saudi Arabia’s defense minister says”, the New York Times, 2 May 2017, available at https://www.nytimes.com/2017/05/02/world/middleeast/saudi-arabia-iran-defense-minister.html?_r=0. See, for example, Nicole Hemmer and Tom Switzer “Why Republicans reject the Iran Deal – and all diplomacy”, the New York Times, 25 August 2015, available at https://www.nytimes.com/2015/08/26/opinion/why-republicans-reject-the-iran-deal-and-all-diplomacy.html; “Israeli prime minister Binyamin Netanyahu: don’t believe Iran’s ‘charm offensive’”, CBSNEWS, 1 October 2013, https://www.cbsnews.com/news/israeli-prime-minister-benjamin-netanyahu-dont-believe-irans-charm-offensive/. Off-the-record comments made by European official based in Lebanon, December 2016. “Iran rocket launch condemned by Germany, France, UK and US”, Deutsche Welle, 3 August 2017, available at http://www.dw.com/en/iran-rocket-launch-condemned-by-germany-france-uk-and-us/a-39944936. Najmeh Bozorgmehr, “Iran hopes for $50bn in investment as sanctions lifted”, Financial Times, 17 January 2016, available at https://www.ft.com/content/569c625c-bd04-11e5-9fdb-87b8d15baec2. During private meetings, business leaders and officials inside Europe and Iran repeatedly underscore this disappointment. See also David Ramin Jalilvand, “Despite nuclear deal, EU firms still cautious on Iran”, Al-Monitor, 3 April 2017, available at http://www.al-monitor.com/pulse/fa/contents/articles/originals/2017/04/iran-eu-nuclear-deal-sanctions-relief-business-trade.html. Aliya Ram, “Politics chill Iran’s attempts to attract foreign capital”, Financial Times, 8 May 2017, available at https://www.ft.com/content/f56463dc-28fe-11e7-bc4b-5528796fe35c; Barbara Slavin, “Why big European banks are reluctant to return to Iran”, Al-Monitor, 3 May 2016, available at http://www.al-monitor.com/pulse/originals/2016/05/iran-banks-faster-return-big-european-banks.html. See, for example, Martin Arnold, “Europe’s banks begin tentative return to Iran”, Financial Times, 3 April 2016, available at https://www.ft.com/content/75dc8d7e-f830-11e5-803c-d27c7117d132; “French state bank BPI to fund projects in Iran, CEO tells paper”, Reuters, 24 September 2017, available at https://uk.reuters.com/article/uk-france-bpi-iran/french-state-bank-bpi-to-fund-projects-in-iran-ceo-tells-paper-idUKKCN1BZ0C2. At the time of writing, based on the author’s interviews with European governments and business leaders, no major European bank has dealt with Iranian businesses since the conclusion of the JCPOA in 2015. Off-the-record interviews with European officials May-September 2017. Off-the-record comments made by senior Iranian official, June 2016. Interviews with senior European officials, September 2017. See also Laura Rozen, “Europeans: Trump can win on Iran without ending nuclear deal”, Al-Monitor, 25 September, 2017 available at http://www.al-monitor.com/pulse/en/originals/2017/09/europeans-trump-win-iran-nuclear-deal-tehran-rouhani.amp.html (hereafter, “Europeans: Trump can win on Iran without ending nuclear deal”). See footnote 5. See also “Speech by the High Representative/Vice President Federica Mogherini at the 2017 Carnegie Nuclear Policy Conference”, Washington, 20 March 2017, available at https://eeas.europa.eu/headquarters/headquarters-homepage/23056/high-representativevice-president-federica-mogherini-2017-carnegie-nuclear-policy-conference_en. “Europeans: Trump can win on Iran without ending nuclear deal”. “Remarks by President Trump to the 72nd session of the United National General Assembly”. See Rex Tillerson’s testimony to House Foreign Relations Committee, 14 June 2017, available at https://www.youtube.com/watch?v=1TNtFuSIzKA. See Kait Bolongaro, “EU Congratulates Rouhani on Iran election win”, Politico, 20 May 2017, available at http://www.politico.eu/article/eu-congratulates-rouhani-on-iran-election-win/. “France says Rouhani re-election strengthens hope of Iran nuclear deal application”, Reuters, 21 May 2017 http://www.reuters.com/article/us-iran-nuclear-trump-germany/trumps-iran-plans-driving-eu-toward-russia-and-china-germany-idUSKBN1CH2OK?il=0. Fabio Benedetti Valentini, “France Seeks to Save Iran Nuclear Deal”, Bloomberg, 15 October 2017, available at https://www.bloomberg.com/news/articles/2017-10-15/france-wants-to-save-iran-deal-macron-considers-potential-trip. https://www.cnbc.com/2017/08/07/the-associated-press-iran-signs-its-biggest-ever-car-deal-with-frances-renault.html; Monavar Khalaj, “European carmakers on the road back to Iran after nuclear deal”, 25 August 2017, Financial Times, https://www.ft.com/content/79abb02e-8191-11e7-94e2-c5b903247afd; Anna Hirtenstein, “U.K. brushes off Trump on Iran With $720 Million Solar Deal”, Bloomberg, 20 September 2017, available at https://www.bloomberg.com/news/articles/2017-09-20/u-k-brushes-off-trump-on-iran-with-720-million-solar-deal. Off-the-record comments made by former US officials, foreign policy advisers to the National Security Council, US foreign policy experts, and staff of Congress members, during interviews and meetings with the author January-July 2017. Comments made by E3 officials during interviews and roundtables with the author, September-October 2017. Off-the-record comments made by former and current US officials to the author, March-June 2017. Comments made by former senior US official during interview with author, March 2017. Karen DeYoung, “Tension between CIA and Trump White House persist over personnel and policy”, the Washington Post, 15 March 2017, available at https://www.washingtonpost.com/world/national-security/tension-between-cia-and-trump-white-house-persists-over-personnel-and-policy/2017/03/15/0694bf76-09b5-11e7-b77c-0047d15a24e0_story.html?utm_term=.fc31c79046e6. According to the White House, Trump used his presence at the G20 summit to encourage countries and companies to “stop doing business” with Iran. See “Press Briefing by Principal Deputy Press Secretary Sarah Sanders and Director of Legislative Affairs Marc Short”, 10 July 2017, available at https://www.whitehouse.gov/the-press-office/2017/07/10/press-briefing-principal-deputy-press-secretary-sarah-sanders-and. See “Trump’s top general says Iran honoring nuke deal”, Foreign Policy, 26 September 2017, available at http://foreignpolicy.com/2017/09/26/trumps-top-general-says-iran-honoring-nuke-deal/. “IAEA Director General’s introductory statement to the Board of Governors”, IAEA, 11 September 2017, available at https://www.iaea.org/newscenter/statements/iaea-director-generals-introductory-statement-to-the-board-of-governors-11-september-2017. For collection of Trump’s statements on the Iran nuclear deal, see “Trump: Iran hasn’t lived up to spirit of nuclear deal”, 5 October 2017, MSNBC, available at http://www.msnbc.com/brian-williams/watch/trump-iran-hasn-t-lived-up-to-spirit-of-nuclear-deal-1063994947887. See “Remarks by President Trump on Iran Strategy”, The White House, 13 October 2017. Ben Hubbard and Thomas Erdbrink, “In Saudi Arabia, Trump reaches out to Sunni nations, at Iran’s expense”, the New York Times, 21 May 2017, available at https://www.nytimes.com/2017/05/21/world/middleeast/saudi-arabia-iran-donald-trump.html?mcubz=3. See, for example, Jeffery Goldberg, “The Obama Doctrine”, the Atlantic, 10 March 2016, available at https://www.theatlantic.com/magazine/archive/2016/04/the-obama-doctrine/471525/. Missy Ryan and Anne Gearan, “Trump administration looks to resume Saudi arms sale criticized as endangering civilians in Yemen”, the Washington Post, 8 March 2017, available at https://www.washingtonpost.com/world/national-security/trump-administration-looks-to-resume-saudi-arms-sale-criticized-as-endangering-civilians-in-yemen/2017/03/08/a259090a-040e-11e7-b1e9-a05d3c21f7cf_story.html%3Futm_term=.bbf8463ba9f4?utm_term=.e9a15aaf5b8b. Patrick Wintour, “Donald Trump tweets support for blockade imposed on Qatar”, the Guardian, 6 June 2017, https://www.theguardian.com/world/2017/jun/06/qatar-panic-buying-as-shoppers-stockpile-food-due-to-saudi-blockade. “Trump in Saudi Arabia: first foreign trip starts as home troubles mount”, BBC, 20 May 2017 http://www.bbc.co.uk/news/world-us-canada-39984903. This group is believed to include national security adviser General HR McMaster, White House chief of staff General John Kelly, secretary of state Rex Tillerson and secretary of defence General James Mattis. “Tillerson Acknowledges ‘Differences’ With Trump on Iran Deal”, the Atlantic, 1 August 2017, available at https://www.theatlantic.com/news/archive/2017/08/tillerson-iran-jcpoa/535602/; Peter Baker, “Trump Recertifies Iran Nuclear Deal, but Only Reluctantly”, the New York Times, 17 July 2017, available at https://www.nytimes.com/2017/07/17/us/politics/trump-iran-nuclear-deal-recertify.html?mcubz=3&_r=0; “Mattis: in US national security interest to stay in Iran deal”, CNN, 3 October 2017, available at http://edition.cnn.com/2017/10/03/politics/mattis-iran-nuclear-deal-national-security/index.html/. For background see Mark Perry, “James Mattis’ 33-year Grudge Against Iran”, Politico Magazine, 4 December 2016, http://www.politico.com/magazine/story/2016/12/james-mattis-iran-secretary-of-defense-214500. Off-the-record comments made by former adviser to the National Security Council, since appointed as a US official, during interview with the author, February 2017. Off-the-record comments made by former senior US official, during interview with author July 2017. See also “Remarks by President Trump on Iran Strategy”. Off-the-record comments made by US official during interview with author, May 2017. See also “Trump to weigh more aggressive US strategy on Iran”, Reuters, 12 September 2017, available at https://www.reuters.com/article/us-usa-trump-iran-exclusive/exclusive-trump-to-weigh-more-aggressive-u-s-strategy-on-iran-sources-idUSKCN1BM2WJ. Jennifer Jacobs and Margaret Talev, “Tillerson Says He’ll Talk to Iran's Zarif ‘at the Right Time’,” Bloomberg, 20 May 2017, available at https://www.bloomberg.com/news/articles/2017-05-20/tillerson-says-he-ll-talk-to-iran-s-zarif-at-the-right-time; “Tillerson meeting Iran’s Zarif, no shoes thrown”, CNN, 21 September 2017, available at http://edition.cnn.com/2017/09/20/politics/tillerson-unga-press-briefing/index.html. Off-the-record interview with US official, May 2017.
https://www.washingtonpost.com/politics/iran-deals-future-may-hinge-on-face-saving-fix-for-trump/2017/10/03/6c7373fc-a878-11e7-9a98-07140d2eed02_story.html?utm_term=.9a54a8550c33. For background see Ellie Geranmayeh, “What if Trump decertifies the Iran deal?”, European Council on Foreign relations, 6 October 2017, available at https://www.ecfr.eu/article/commentary_what_if_trump_decertifies_the_iran_deal. See, for example, “Rex Tillerson was startled that Trump told reporters he had made up his mind on Iran deal”, the Washington Post, 20 September 2017, available at https://www.washingtonpost.com/news/post-politics/wp/2017/09/20/rex-tillerson-was-startled-that-trump-told-reporters-he-had-made-up-his-mind-on-iran-deal/. See “Iran says US Navy fired warning flares at its vessels”, CNN, 30 July 2017, available at http://edition.cnn.com/2017/07/29/middleeast/iran-says-us-navy-fired-warning-flares-at-its-vessels/index.html. Nicholas Blanford, “At remote desert garrison in Syria, a US-Iran confrontation is brewing”, the Christian Science Monitor, 6 June 2017, available at https://www.csmonitor.com/World/Middle-East/2017/0606/At-remote-desert-garrison-in-Syria-a-US-Iran-confrontation-is-brewing. US officials have stated that since 2017 there have been at least 13 incidents of an Iranian drone approaching US fighter jets while in the Persian Gulf. See “Iranian drones come close to US aircraft carrier: US navy”, Reuters, 14 August 2017, available at https://www.reuters.com/article/us-usa-iran-drones-idUSKCN1AU1Z7. “US puts new sanctions on Iran over ballistic missile programme”, Reuters, 18 July 2017, available at https://www.reuters.com/article/us-iran-nuclear-usa/u-s-puts-new-sanctions-on-iran-over-ballistic-missile-programme-idUSKBN1A31GQ; Mike DeBonis and Karoun Demirjian, “Congress breaks impasse on bill to slap sanctions on Russia, Iran and North Korea”, the Washington Post, 22 July 2017, available at https://www.washingtonpost.com/powerpost/congress-breaks-impasse-on-bill-to-slap-sanctions-on-russia-iran-and-north-korea/2017/07/22/c89d5cb6-6d58-11e7-96ab-5f38140b38cc_story.html. Off-the-record comments made by senior Iranian official during interview with author, March 2017. Off-the-record comments made by senior Iranian official during meeting with author, June 2017. See, for example, the televised debates during Iranian presidential elections where all candidates pledged their support to the JCPOA. Off-the-record interview by author with senior adviser to the Iranian government, May 2017. Erin Cunningham, “Iran’s president fires back at Trump on nuclear deal”, the Washington Post, 13 October 2017, available at https://www.washingtonpost.com/world/middle_east/iran-blasts-trumps-moves-against-nuclear-deal-revolutionary-guard/2017/10/13/f5d6c5de-aeba-11e7-9b93-b97043e57a22_story.html?utm_term=.0a798ba0f0f1. “Rouhani: We must not get caught in US ‘trap’”, Reuters, 19 July 2017, available at http://www.al-monitor.com/pulse/originals/2017/07/iran-rouhani-reaction-us-sanctions-trump-jcpoa-trap.html. Interview with senior Iranian official, July 2017. “Europe should avoid meddling into matters of our defense: Ayatollah Khamenei”, Khamenei.IR, 18 October 2017, available at http://english.khamenei.ir/news/5218/Europe-should-avoid-meddling-into-matters-of-our-defense-Ayatollah. Interview with senior Iranian expert advising the Iranian government on Russia-Iran relations, October 2017. Thomas Erdbrink, “Iranian Parliament, Facing U.S. Sanctions, Votes to Raise Military Spending”, the New York Times, 13 August 2017, available at https://www.nytimes.com/2017/08/13/world/middleeast/iranian-parliament-facing-us-sanctions-vote-to-raise-defense-spending.html; Bozorgmehr Sharafedin,“Defying Trump, Iran says will boost missile capabilities”, Reuters, 22 September 2017, available at https://uk.reuters.com/article/uk-iran-military-usa/defying-trump-iran-says-will-boost-missile-capabilities-idUKKCN1BX0IW. See “Iran Condemns Fresh US Sanctions on Iranian Entities”, Iran Front Page, available at http://ifpnews.com/exclusive/iran-condemns-fresh-us-sanctions-iranian-entities/. Golnar Motavelli and Ladane Nasseri, “Rouhani Says Negotiating Iran Nuclear Deal ‘Out of Question’”, Bloomberg, 17 january 2017, available at https://www.bloomberg.com/news/articles/2017-01-17/rouhani-says-renegotiating-iran-nuclear-deal-out-of-question; “Trump can’t renegotiate the Iran Nuclear Deal, Rouhani Says”, 17 January 2017, the New York Times, available at https://www.nytimes.com/2017/01/17/world/middleeast/iran-trump-nuclear-deal.html; Thomas Erdbrink, “Iran says missile programme non-negotiable, denies report”, the New York Times, 17 January 2017, available at http://en.mehrnews.com/news/128380/Iran-says-missile-programme-non-negotiable-denies-report. See, for example, Julian Borger, “Iran’s foreign minister urges Europe to defy US if Trump sinks nuclear deal”, the Guardian, 29 September 2017, available at https://www.theguardian.com/world/2017/sep/29/iran-foreign-minister-zarif-europe-trump-nuclear. Off-the-record comments made by senior Iranian officials, June 2017. On 27 August 2017, Ali Akbar Salehi, said if Washington withdraws but the five other parties remain committed, Tehran would remain committed. See Lauren Norman et al, “U.N. nuclear watchdog certifies Iran’s compliance with nuclear deal”, the Wall Street Journal, 31 August 2017, available at https://www.wsj.com/articles/u-n-nuclear-watchdog-certifies-irans-compliance-with-nuclear-deal-1504193625. See comments from Iranian foreign minister Mohammad Javad Zarif, “If America reneges on the deal to the level that the continuation of the [JCPOA] harms our national interests, the Islamic Republic of Iran is completely ready to return to the pre-J.C.P.O.A. situation and will be even stronger”, the Islamic Republic News Agency, 20 March 2017, available at http://www.irna.ir/esfahan/fa/News/82470128. “Iran's top priority to protect nuclear deal from US: Rouhani”, Associated Press, 20 August 2017, available at https://www.yahoo.com/news/irans-top-priority-protect-nuclear-deal-us-rouhani-075713874.html. Ali Akbar Salehi, “If the Iran deal is to survive, the west must change course”, the Guardian, 23 June 2017, available at https://www.theguardian.com/commentisfree/2017/jun/23/iran-nuclear-deal-survive-west-change-course-engagement. Series of off-the-record interviews with Iranian and European officials, January-September 2017. Tom O’Connor, “U.S. military must leave Iran’s borders and stop calling US terrorists, revolutionary guards say”, Newsweek, 19 July 2017, available at http://www.newsweek.com/us-military-leave-iran-borders-stop-calling-terrorists-revolutionary-guards-639274. Bozorgmehr Sharafedin, “Iran promises ‘crushing’ response if U.S. designates Guards a terrorist group”, Reuters, 9 October 2017, available at https://www.reuters.com/article/us-iran-usa-irgc/iran-promises-crushing-response-if-u-s-designates-guards-a-terrorist-group-idUSKBN1CE0M2. Simon Tisdall, “Consequences of attacks in Tehran will be felt around the world”, the Guardian, 7 June 2017, available at https://www.theguardian.com/world/2017/jun/07/iran-tehran-attacks-parliament-khomeini-isis-saudi-arabia-donald-trump. See Rouhani’s televised speech, 13 October 2017, available at https://www.youtube.com/watch?v=WKGT9ZFox7w. Comments made by senior Iranian official during private meeting, May 2017. For background on disagreements over Iranian missile programme see Bozorgmehr Sharafedin, “Khamenei says missiles, not just talks, key to Iran’s future”, Reuters, 30 March 2016, available at http://www.reuters.com/article/us-iran-missiles-khamenei-idUSKCN0WW0PT. See Rouhani’s speech to the United Nations General Assembly, 20 September 2017, available at https://www.c-span.org/video/?434329-3/iranian-president-rouhani-remarks-un-general-assembly. Mohammad Javad Zarif, “Today, Iranians--boys, girls, men, women--are ALL IRGC; standing firm with those who defend us & the region against aggression & terror”, 14 October 2017, available at https://twitter.com/JZarif/status/919213092197814272. EU Council Regulation No 2271/96 of 22 November 1996 (the ‘Blocking Regulation’). See also “Détente with Iran: How Europe can Maximise the Chances of a Final Nuclear Deal”, Ellie Geranmayeh, European Council on Foreign Relations, 3 June 2014, available at https://www.ecfr.eu/publications/summary/detente_with_iran_how_europe_can_maximise_the_chances_of_a_final_nuclea309.